FLAC (Free Lossless Audio Codec) is a musical file format that offers bit-perfect copies of CDs at half the size, and is compatible with many phones, MP3 players, and hi-fi components. FLAC is a codec (compressor-decompressor or coder-decoder) which allows digital audio to be losslessly compressed such that file size is reduced without any information being lost. Digital audio compressed by FLAC's algorithm can typically be reduced to 50-60% of its original size, and decompressed into an identical copy of the original audio data. FLAC is an open format with royalty-free licensing and a reference implementation which is free open source software. FLAC has support for metadata tagging, album cover art, and fast seeking. FLAC supports only fixed-point samples, not floating-point. It can handle any PCM bit resolution from 4 to 32 bits per sample, any sampling rate from 1 Hz to 655,350 Hz in 1 Hz increments, and any number of channels from 1 to 8. Channels can be grouped in cases like stereo and 5.1 channel surround to take advantage of interchannel correlations to increase compression. FLAC uses CRC checksums for identifying corrupted frames when used in a streaming protocol, and also has a complete MD5 hash of the raw PCM audio stored in its STREAMINFO metadata header. FLAC allows for a Rice parameter between 0 and 16. FLAC supports ReplayGain. It's no problem when playing FLAC in computer. However, in some cases we want to play the FLAC music in other player such as car's CD player, Hi-Fi sound system. So, we need to burn the FLAC to CD. I'm here to introduce you a freeware to burn FLAC to CD. It's foobar2000. foobar2000 is an advanced freeware audio player for the Windows platform. the freeware supports popular audio formats including MP3, MP4, AAC, CD Audio, WMA, Vorbis, FLAC, WavPack, WAV, AIFF, Musepack, Speex, AU, SND, and more with additional components. With Audio CD Writer component, the foobar2000 allows you to burn audio CDs from any of supported audio formats, through context menu commands. Once the Audio CD Writer component is downloaded completed, please right-click on the file and choose "Install" to install the component to foobar2000. To burn FLAC to CD, please add the FLAC files to foobar2000 freeware, and then select the FLAC files that you want to burn to CD and then right-click on the items and choose "Write audio CD." And then, insert a CD-R or CD-RW disc to CD burner, and then start burn. foobar2000 freeware works with Windows 2000, Windows XP, Windows Vista, Windows 2003 Server, Windows 2008 Server, Windows 7, and Windows 8, both 32-bit and 64-bit editions compatible. 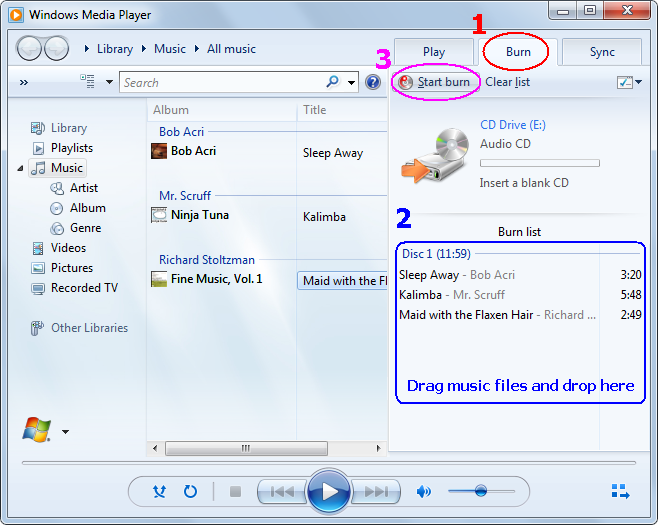 If FLAC codec has been installed on your system and then Windows Media Player could play FLAC file, you could burn FLAC to CD with WMP without installing any software. FLAC codec is included in K-Lite Codec Pack. 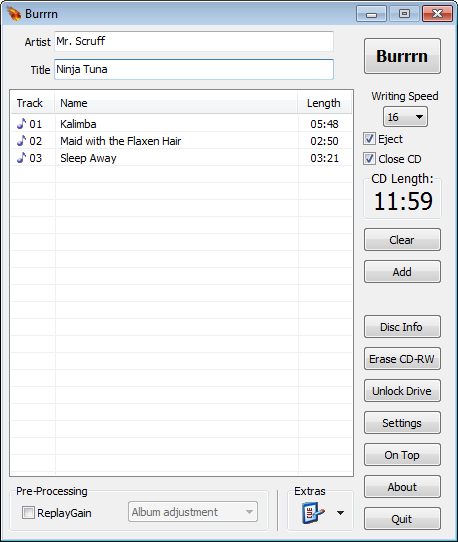 If you're using Windows XP or Windows 2000, you can also burn FLAC to CD with Burrrn freeware. Click Add to add FLAC files, and set writing speed, and then click Burrrn to burn FLAC files to CD.